Holiday Pomegrante Shower Gel hydrates and gently cleans and conditions your skin, leaving it soft, supple and showered in the wonderful holiday garden scent of Pomegranate, Citrus, Dewberry, Blackberry, Iris, Jasmine. 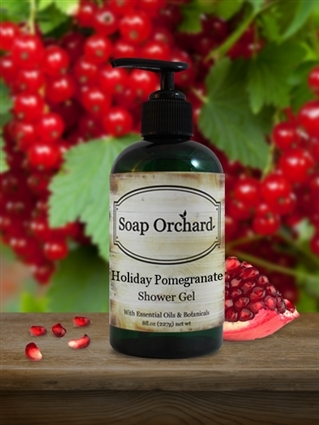 Pomegranate Extract helps soothe dry and irritated skin. Its content of punicic acid, an Omega 3 fatty acid, keeps the skin constantly hydrated by sealing in moisture. Pomegranate extract is beneficial for oily skin as well. Deionized Water, Sodium Laureth Sulfate, Cocamidopropyl Betaine, Cocamide DIPA, Aloe barbadensis (Aloe Vera) Leaf Juice, Hamamelis virginiana (Witch Hazel) Distillate, Chamomilla recutita (Matricaria) Flower Extract, Citric Acid, Sodium Chloride, Phenoxyethanol, Ethylhexylglycerin, Hexylene Glycol, Caprylyl Glycol, Pomegranate Fragrance Oil, Citrus aurantium (Orange) Essential Oil and Punica granatum (Pomegranate) Extract.